Have fun and wish you all the best in whatever you guys do! Anyone fancy a Ping.sg T-shirt? The one which we will wear proudly proclaiming ourselves as a proud member of this community? The one we would be wearing together when we attend any event as a Ping.sg group?This idea has been surfaced and not taken off a few times since the launch of Ping.sg 1 year ago. One of the main reasons are due to lack of good T-shirt designs that I managed to find. This time, let’s get it done! Instead of myself scouting for private designers on my own, which may not even know exactly what Ping.sg about, why don’t we do it the community way this time. Ping.sg do have quite a few of good designers among us, aren’t we? I say, let’s start a Ping.sg T-shirt Design contest! The winning entry will be getting SGD 100 from Ping.sg. It’s not a lot, but it is some money I can offer that I have made from Ping.sg (through advertising) minus the costly Singapore hosting fees. Most importantly, you will gain the recognition and respect among Ping.sg’s community as the official Ping.sg T-Shirt designer, and you can be proud seeing your design worn by local bloggers. 1. 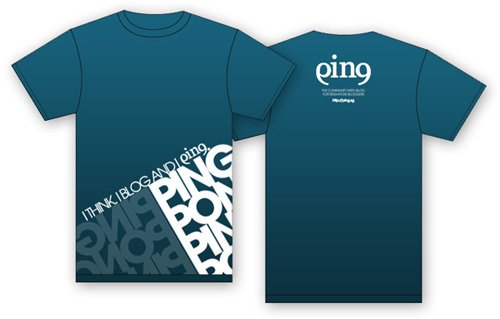 It is a Ping.sg t-shirt, so, yeah the t-shirt has to have Ping.sg’s logo. 2. Ping.sg’s URL – http://ping.sg. We don’t want ourselves to be mistaken for promoting for a golf equipment company. 3. Nothing else. Feel free to be creative.